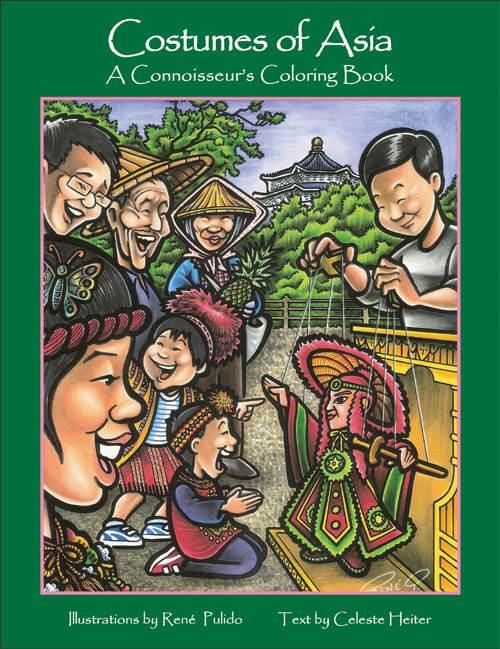 Featuring coloring pages of costumes in twenty Asian countries, Costumes of Asia invites both children and adults to discover the Asian continent through its fashion traditions. While coloring lively pictures featuring unique clothing and settings, readers will travel to countries such as Mongolia, where they will learn about the specially designed deel that is worn year-round to protect from the harsh climate, and to Korea, where the elaborate hanbok is worn by both men and women on special occasions. Along with providing an entertaining journey through the costumes of Asia, this coloring book also makes learning a fun, active process. Celeste Heiter is a freelance writer and graphic artist with a fascination for Asian culture. She also has a background in tailoring and fashion design. She is the author of several books published by ThingsAsian Press, including Ganbatte Means Go For It, Vignettes of Japan, Five Seven Five, and The Sushi Book. Celeste lived for two years in Tokyo, and currently resides in California’s Napa Valley with her son Will, who was born in Japan. René Pulido, illustrator and caricature artist, is a native and resident of California’s Napa Valley. René spent much of his childhood in Morelia, Mexico, where he studied art and later worked as a graphic designer. Although René’s cultural roots are in Mexico, he has a keen appetite for international culture. In addition to his talent as an illustrator, René works as a caricature artist at parties and special events around the San Francisco Bay Area.